"I had to persist there and try to get that question asked." In the 167 days between Donald Trump‘s last press conference and today’s, little about his attitude has changed. Not his electoral victory, not his imminent ascension to the highest office in the land has altered the man who stood in front of the podium offering vague promises of great things ahead, referring to himself in third person, using his victory as justification for ignoring decades of precedent. 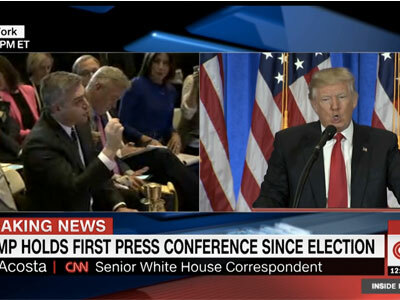 At one point during this news conference, just in the interest of full disclosure and so everybody knows what’s going on and what was happening in the room, after I asked, and I guess you might say demanded, that we have a question, Sean Spicer, the incoming press secretary did say to me that if I were to do that again I was going to be thrown out of this press conference. Of course, Wolf, I had to persist there and try to get that question asked.